Brand new single family home with Electric, fish cleaning sink and water on dock. Huge patio on river side. Entry has covered porch. Gorgeous view of river from Living, dining room, kitchen and master bedroom. Fish right off the dock. Over 2100 square feet under AC. Wildlife in abundance, turkey, osprey, cranes, hawks, owls, eagles and more. Basic spices and staples are in home. Last 6 pictures are of cottage on property. This cottage does NOT go with the house. It can be leased for an additional fee or by itself. We purchased this property with a double wide on it with intentions to build a home if we liked it there. We loved it so in 2012 we built this home. This home was built to maximize the gorgeous views from the home with as many rooms having a view as possible. Everything is here to make your stay as comfortable as possible. All the upgrades you can imagine. convention oven, induction stove, icemaker, dishwasher, toaster oven, blender, crock-pot ,Kerug and regular coffee pots and microwave.All upgraded appliances. House has fully equipped kitchen including microwave and ice maker, induction stove top/kitchen aide convection oven kitchen aide dishwasher. Granite counter-tops. All cabinets have pull out drawers with soft close. Master bath has Jacuzzi tub plus walk in shower. Enclosed toilet area. All marble bathrooms. Living room has leather furniture with power motion Gas remote control fireplace with marble mantle. All wood floors. Dining room table has 2 extensions leaves seats 6 or more. All linens with extra sheets/blankets. Satellite TV. 60 inch HDTV in Living room and HDTV in master and guest bedrooms. Washer and dryer. Gas grill. Deck outside by river. Dock has water, electric fish cleaning station and lights plus boat whips. Spices, flour and sugar along with coffee filters are provided for your convenience. Toilet paper , paper towels, bath soap and napkins for weekend rental. Plenty of lawn chairs available outside and on the dock. House has 1 king bed and 2 queen. Maid service can be available for an extra fee. My husband and I just returned from spending 3 nights and 4 days at this beautiful home in an amazing and tranquil location. We trailered our boat and easily launched it as soon as we arrived at the convenient boat ramp located at the end of the road. This spacious and lovely home has everything you need to enjoy a relaxing and restful visit. The gourmet kitchen is filled with everything needed to prepare simple or complex meals. There are Stunning views of the water from the entire back side of the house, including the master bedroom. 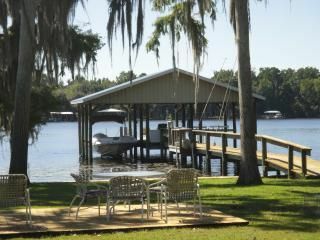 The large screened porch off the living room with waterfront views is a great spot to enjoy more outdoor living space. We grilled 2 nights while we were there, and enjoyed dining out for the 3rd just a short ride by boat or car near this home. Joyce, the owner, was responsive and helpful, especially since we decided last minute that we were available and could get away to visit her luxurious home. There's so much room throughout the entire house and property. The boating was fantastic. Lake George was large and smooth as glass 2 of the days that we boated across it. Silver Glen Springs was stunning and refreshing. We also visited Salt Springs, and headed north just south of Palatka. This is a wonderful and rejuvenating place to enjoy and explore - especially on the water. Thanks so much for the great review of the property. I am happy that you enjoyed it as much as I do. It was a pleasure to have you and you are welcome anytime. The home and area far exceeded our expectations. The home is in a quiet location, well appointed, clean and even the neighbors were fun to hang out with. You can't beat the convenient location, especially if you are going to use the river. Lake George, Salt Springs and Silver Springs are to the south and the Oklawaha River is to the north. Would not hesitate to stay hear again. Thank you so much for the great review. You are welcome any time. Excellent , Elegant and Relaxing ..
We just spent a week here . Had a great time . Water access was perfect .. The house is very comfortable . Springs are a short boat ride away .. Wild life is amazing right in the back yard .. eagles , barred owl, water turtles and others . Would definitely stay again ..
My husband, daughter, and daughter's boyfriend and I spent a long weekend here. The pictures did not do this home justice. The home is well appointed and beautifully decorated. Our hosts were excellent communicators throughout the process. We enjoyed the barred owl and myriad of other birds--and of course, the tiny lizards were delightful. While we enjoyed a couple of dinners out, we also cooked at the house a few nights enjoying leisurely evenings with beautiful sunsets. I would stay here again in a heart beat. The mornings having breakfast on the screened-in patio are my favorite memory. Thanks so much for the great review. You were an amazing guest. Every conversion with you was great. Wonderful accommodations on Lake George !! We enjoyed the month of January 2017 at this gorgeous lake house on the St. Johns River near Lake George. Everything was exactly as described ...accommodations and neighbors were all great ! Thanks much for sharing your newer home with us !! I am so glad you enjoyed. You were also great tenants. Please come again. Just getting away from all the noise of a city.